The roads were icy as a freezing, miserable rain fell. The signs on the highway warned, Only Travel if Necessary. “This was necessary,” says Pieter Colpaert of Brooklyn, raising his sample of the small-batch bock called I’ll Be Bock. 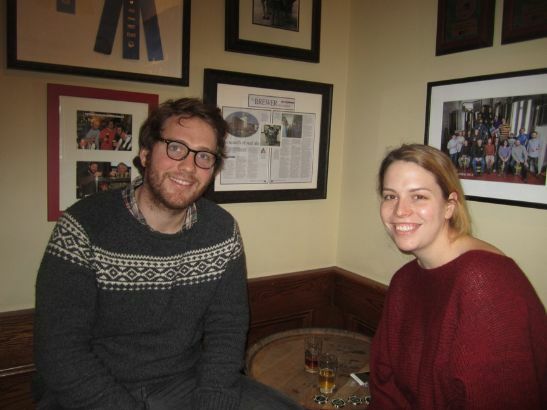 It’s a long weekend, and Pieter and Kelly Lanestaff, also of Brooklyn, had planned to get away to Philadelphia. When Mother Nature coated the streets in a perilous glaze, the pair sought a destination closer to home, and ended up in Captain Lawrence. “It’s a holiday weekend and we wanted to do something,” says Kelly. A Belgian, Pieter is smitten with another Belgian–the Liquid Gold. “It reminds me of Duvel,” he says. Kelly, a devotee of Sierra Nevada, likes the Hop Commander IPA. It being Martin Luther King Day weekend and all, they’re discussing the film Selma (“Incredible,” says Pieter) and enjoying a few samples on a relaxing Sunday. Not many have braved the slick roadways. The beertenders, Jack and Doug, are discussing the previous night’s staff holiday party (A Captain Lawrence staff holiday party is, well, exactly how you picture it). The Police’s debut classic “Outlandos d’Amour” fills the airwaves. The 2 p.m. tour lets out and there’s suddenly a decent showing in the tasting room. Scott Hirsch of Armonk estimates he’s been on a few dozen Captain Lawrence tours over the years. An avid home brewer—the first taste of his in-the-works Flanders red ale was “awesome,” he says—he’s always curious what’s brewing backstage. “I like to see what’s cooking in the fermenters,” Scott says. Scott is sipping the new Ginger Man coffee milk stout, a pilot system brew. “The Knifey has nothing to worry about,” he quips, a nod to staffer Rob Catalano’s Knifey Moloko stout, which won the Captain’s inaugural “Hop Bowl” last year. Scott had to swing by Home Depot, he says, and, well, the brewery is just down the road. 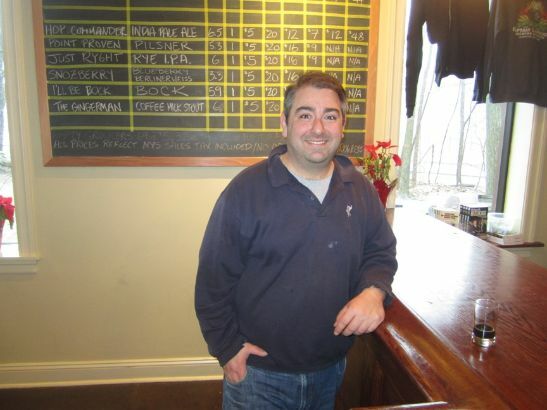 His pal David Newman of Edgemont has the Freshchester Pale Ale. “I’m more of a lighter beer kind of guy,” he says. Sam leans in the other direction, quaffing the Ginger Man stout. 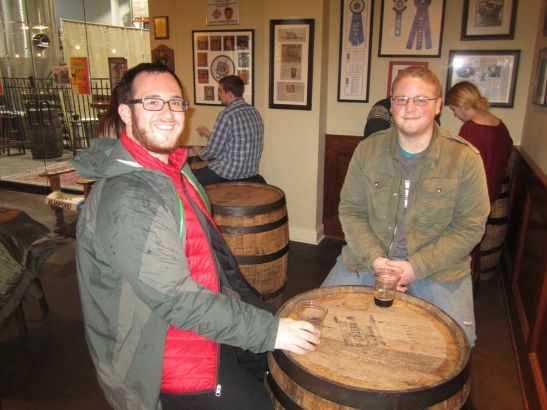 “I tend to turn to dark beers in the winter,” Sam says. Students at Vassar, they may not have class on Martin Luther King Day, but there’s work to be done nonetheless. A music major, Sam has to read a biography on Beethoven. For his part, David is working on a friend’s film. 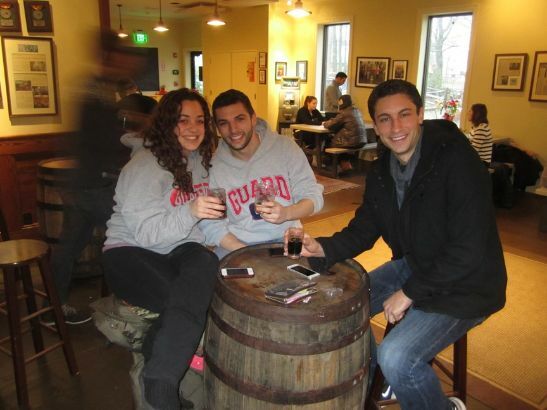 Elsewhere in the tasting room, Mike Belloli of Hawthorne and Juliet Soricelli and Ben Kardian of Valhalla are enjoying the lack of a crowd in the tasting room. They were the only ones at the Hawthorne Japanese restaurant Hida for lunch, and had an hour or two to hang before the football action started. Mike has the Liquid Gold, Juliet the Ginger Man and Ben the Hop Commander IPA. “Nothing was going to stop us,” says Mike. The “Notes From the Captain Lawrence Tasting Room” book is for sale at the brewery, at Village Bookstore in Pleasantville, and on Amazon. Previous ArticleSports Bars in Rockland, Westchester: Where to Watch the Game!